In a still from Trapped, clinic escorts gather to pray at Reproductive Health Services in Montgomery, Ala. When Dawn Porter arrived in Jackson, Mississippi in the spring of 2013, she did not intend to join the fight over abortion. An award-winning documentary filmmaker, Porter was working on another project, and she thought the issue of abortion rights was settled, squared away with the 1973 Roe v. Wade decision. Then, skimming the local paper one day, Porter came across a startling statistic: In all of Mississippi, a state with more than half a million women of reproductive age, there was only one abortion clinic. Porter, whose other projects include the documentary films Gideon’s Army, about public defenders in the deep South, and Rise: The Promise of My Brother’s Keeper, was stunned. She called the clinic and asked if she could come by to learn more. The result is the documentary film Trapped, which opens nationally on March 4. Trapped brings viewers inside the Southern abortion clinics that have become battlegrounds in the national fight over abortion rights. The protagonists of the film are the clinic workers and lawyers who are fighting to provide high quality medical care to women while simultaneously struggling to keep up with wave after wave of so-called TRAP (Targeted Regulations of Abortion Providers) laws. Since 2010, state legislatures have passed 288 such laws, according to the Guttmacher Institute. The film, which premiered at Sundance in January and won the festival’s Special Jury Award for Social Impact Filmmaking, tracks Whole Women’s Health v. Hellerstedt, a major reproductive rights case that will go in front of the Supreme Court on March 2nd. But it also reveals the intimate details about abortion care that often get lost in ideological debate. Viewers see the ubiquitous security cameras always scanning the ground outside clinics, the cavernous operating rooms mandated by state law, and the stacks of new restrictions that clinic owners must navigate page-by-page with highlighters in hand. I spoke with Dawn Porter and producer Marilyn Ness the day Trapped premiered at Sundance about the most surprising abortion restrictions they encountered, the lengths they saw women go to access abortion, and what the coming Supreme Court arguments will mean for providers and patients across the South. ZOE GREENBERG: How did Trapped come to be? Was it difficult to get access to other doctors and clinics? You entered this labyrinthine world of restrictions and regulations. Are there any that stand out to you as being particularly surprising? DAWN: There are rules that regulate the width of hallways. Most abortions are done in outpatient clinics. They're not done in hospitals for a number of reasons, which means these clinics are like your regular doctor’s office. So states have started passing laws saying they have to make the walls wide enough for a hospital gurney, even though people aren't taken out in hospital gurneys. There are regulations for how many parking spaces you have to have. In Texas, you have to have a negative ventilation pressure system—which is a biohazard requirement. If you had Ebola, you would need a negative ventilation pressure system to remove germs. That is the law in Texas: an abortion facility has to have that biohazard room. MARILYN NESS, PRODUCER: The one that bugs me the most is in the southernmost parts of Texas, there are no abortion clinics. So women who are Latina and poor and sometimes undocumented immigrants have to cross an internal border checkpoint in order to access an abortion clinic. Which means they don't. They can't. The rate of self-induced abortions, and maternal mortality, are climbing hazardously down there. DAWN: There's a study out of the University of Texas: since these TRAP laws have gone into effect, they've estimated that between 100,000 and 240,000 women have tried to self-abort. We're in a pre-Roe reality. MARILYN: It's really troubling to me as a woman who's grown up thinking, “I don't need to put my political capital into this.” And it turns out you do. DAWN: These laws are following a pattern in this country. There's a group, Americans United for Life, and they draft model anti-abortion laws. And they give them to legislators. If something works in Georgia, then they'll try it in Mississippi. And they'll try it in Alabama. So you have this very well-funded, extremely conservative group, and their whole goal is to overturn Roe v. Wade. They funded the lawyers who argued the Casey decision in the 1990s, which paved the way for these restrictions. Roe v. Wade said you can't regulate abortion in the first trimester: End of story, bright line. But in 1993, the Supreme Court decided in Planned Parenthood v. Casey that states could regulate abortions for health and safety reasons, and that's where these laws started to develop. Americans United for Life funded the lawyers who argued that case. 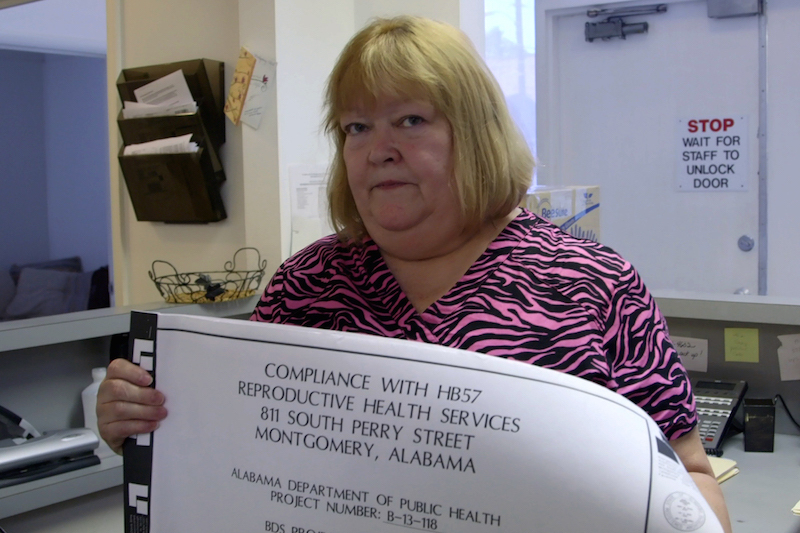 June Ayers, co-owner of Reproductive Health Services in Alabama, displays blueprints for changes to her clinic that are necessary to adhere to new state guidelines. Can you talk about the intersection of race and abortion access? DAWN: What I found in traveling around to clinics is that so many people from racial and ethnic minorities use these clinics. If you don't have health insurance, if you don't have a private OB/GYN, you go to a clinic. So when you think about who's being the most impacted by these laws, it's a population that is underserved in almost every way. Poverty is also a huge issue. Because there's not insurance in most of these states for abortion care, or these women don't have insurance, they're paying cash. The longer you have to wait to have an abortion, the more expensive it becomes, because it could become a more complicated procedure. So I saw people selling items in order to raise the cash to pay for abortions. If you have a child, you need to find childcare. You need to take time off from work. Maybe you have a minimum wage job where you don't have a lot of vacation. Because clinics are closing, you have to travel, maybe hundreds of miles, and stay overnight. We saw people sleeping in cars, with their kids, because they couldn't afford a hotel. When the Center for Medical Progress videos came out this summer, they launched a whole new series of investigations and proposed regulations. Did that change how you were thinking about the film at all, or change any specific scenes within the film? DAWN: It didn't at all. What it did was it made me mad. It gives all of us a bad name when people abuse their rights and mis-edit information. How do you respond to pushback saying you’re not objective or you’re biased? DAWN: The film is going to be on PBS in June. They have a very rigorous vetting process. But I'm pro-choice. This isn't a news piece. It's a documentary. I have an opinion. But I also feel like it's really important to be fair. The film is told from the perspective of people trying to comply with laws. MARILYN: We are very clear that there's a side on the left that feels very firmly pro-choice, and there's a side on the right that feels very firmly anti-choice. But then there's a whole swath in the middle, which I think is a large part of the country, that's sort of unaware of this war that's been raging. There are people who are religious who are being told that to be religious means you have to be anti-choice. Dr. Parker is deeply religious. The nurses in the clinics are deeply religious. When there was going to be a big protest, there's a group prayer for safety and love. And so, I think what we try to do in the film is show that you can both be a religious human being and be an abortion provider. What are you hoping for people to walk away from the film thinking or feeling? DAWN: I hope they're really mad. I think a lot of us are benefiting from the sacrifices of others who don't have the luxury of not showing up. The stigma and shame around abortion impacts 1 in 3 women in this country. I'd love for medical students to demand that they be trained in abortion services. That's another thing that's happening: young doctors are not even trained in the procedure. So the next thing we're going to see is there are no doctors. MARILYN: My hope is that people understand time is short. If you're mad, you need to be mad right now, and to get up and do something right now. This is the seminal moment. This is the landmark decision. This is the Roe v. Wade of our time. Zoe Greenberg is a reporter and writer based in Chicago, Illinois. Her work has appeared in RH Reality Check, the Chicagoist, the Chicago Reader, and Salon. This week, we bring you three stories about the visceral realities of bodies.